Removing Icicles From Gutters. Icicles overhanging your roof may look like a scene from movie, but they can cause a lot of trouble. If left alone, the icicles may melt and refreeze into ice dams or may fall and cause injury to you, your family or guests. When a long-term warm-up is not in the forecast take steps to remove icicles yourself. We do not suggest you climb a ladder and bang them off your gutters with a hammer but rather take some preventative measures to ensure no heavy ice hang down. We have a few tips on preventing icicles and hopefully keeping your home from forming ice dams. Proper Exhaust – Many appliances and rooms in your home produce heat. The kitchen, laundry room, and bathrooms all produce excess heat, and if the exhaust from these areas aren’t properly insulated and caulked, heat can escape into the attic. Maintaining the ducts from these areas is crucial in the fight to stop ice dams and icicles. Check Out Part 2 of removing icicles from gutters on January 27th! Snow & Your Gutters. Winter brings lots of snow and ice storms. One of the most important and troubling problems with all the snow on your home is the damage it can do to your gutters. 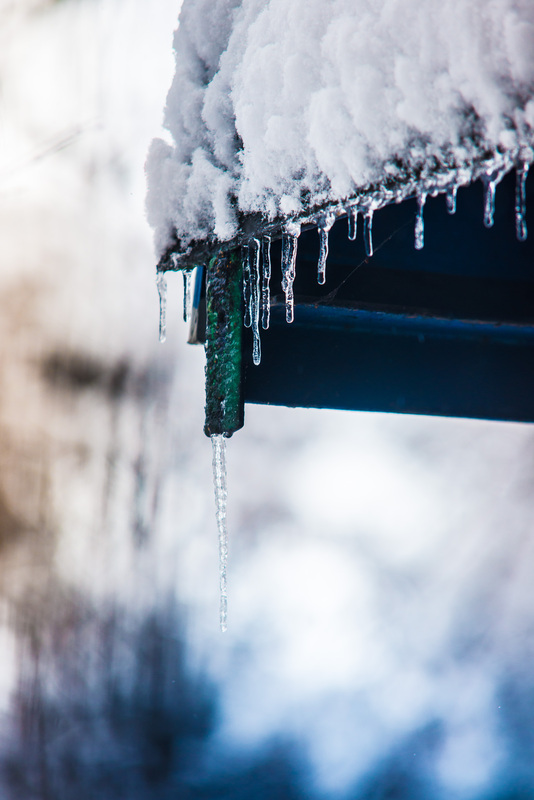 One way that harsh winter weather can damage gutters is ice buildup. 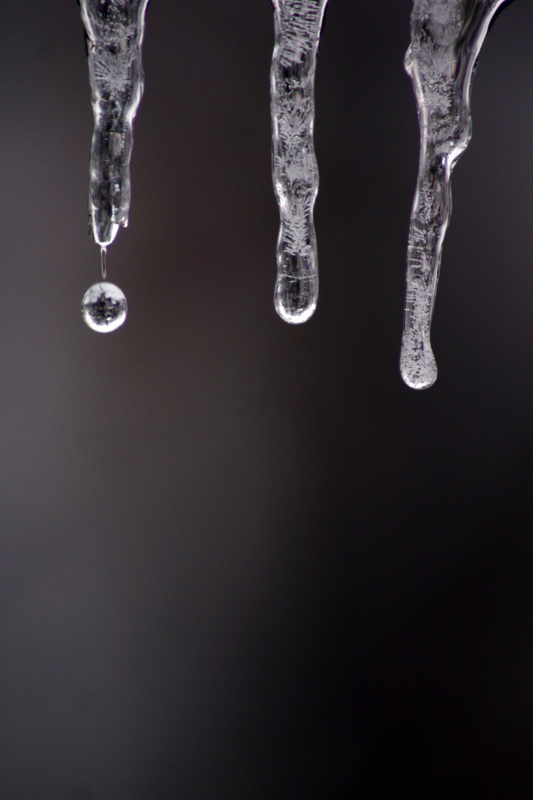 Ice buildup in your gutters prevents the flow of melted snow to your down spouts for proper drainage. The stacked up ice and snow causes the run off to flow over the lip of your gutters and create long icicles. Another equally troubling problem are ice dams. Ice dams start when snow builds up on your roof. Over time, the snow will begin to melt, even if the temperature stays below freezing. The heat from within your home warms your roof and melts the snow from beneath. The run off then enters your gutters, which remain colder than your roof, and re-freezes, creating an ice dam that prevents proper drainage of the snow melt. With ice dams formed, overexposure to moisture is prolonged. As the ice slowly melts over time, water seeps beneath shingles, under the tar paper, and eventually into the plywood beneath. Causing damage to your roof, fascia and soffit. One way to prevent ice dams is to clean out your gutters prior to winter. After all the leaves have fallen from surrounding trees. Clogged gutters will only accelerate the process of ice damming. Overflow will happen when the gutters fill up with ice and snow. To keep the snow on your roof from melting, make sure your roof is well insulated, and that warm air is not escaping. Another way gutters are damaged from snow and ice is from bearing the excessive weight of a big snow fall. Even gutters that are adequately installed. Using the proper material and size for your region, can succumb to the weight of snow and ice. And Break away from their hangers and fall to the ground. 5 Projects To Complete Before Fall. With Fall right around the corner, there are a few projects that will help you keep your home in tip-top shape. After all the summer thunderstorms and weather, its best to inspect your roof for any potential damages, such as missing , curled or buckled shingles. If you cannot climb on the roof or do not feel safe doing so, please call a professional to do so. We suggest our sister company, Rempfer Construction, Inc.
Before the cool breezes settle in the winter, check your exterior doors and windows for any air leaks or light peaking through. Recaulk around your window and door seals. If you need replace weather stripping or the window itself, call a professional to help you find and install the right materials. Fall is the time wear trees shred their leaves. A great way to prevent gutter clogs from happening is by installing gutter guards. There are several types of gutter guards that you can choose from. Screen mesh, hooded and drop in. To learn more about the different types of gutter guards check out our page. To get a free estimate, give us a call! Since the summer months and cookout days are past, it’s time to part with the most beloved item of the back yard. Yes we mean the grill. Give it a good scrub down place in a safe spot until next summer. The end of the summer is the best time to clean the siding on your home. This will prevent any mold or early damage from occurring to your vinyl siding. We suggest you take a look at this cleaning guide to vinyl siding post by our sister company Rempfer Construction,Inc. Painting Aluminum Gutters is not recommended, because it will void any paint finish warranties and can shorten the life of your gutters. If you must paint your gutters due to them being heavily rusted or older and replacing them is out of budget, here’s what you can do. Painting is simple but not easy. CAUTION: Before you go to the paint store you need to note a couple of paint tips. First, you need to look for ammonia-free primers. 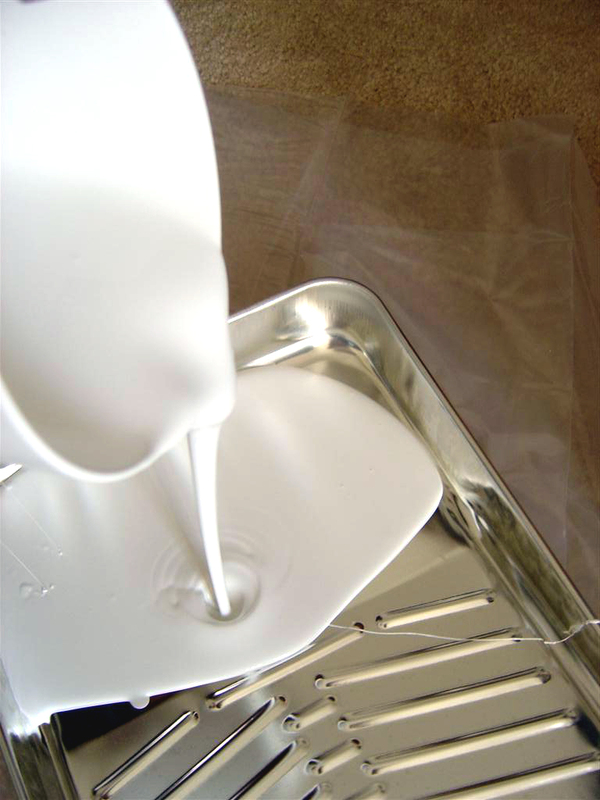 Ammonia reacts with aluminum to create a layer of gas between the aluminum and the paint, which can create a bubbling effect. This bubbling will ruin your paint job. Start by cleaning your gutters. Remove any existing paint. Use the sandpaper and scrubber to remove the old paint. Scrub and wash with soap and water until they are clean and then you can start with primer. Primer can take a while to dry ( sometimes up to 48 hours). After the primer is completely dry, paint two coats of oil-based satin/gloss enamel. 48 hour again until it’s fully dry. Now it’s time for the last coat, paint your gutters with it’s final color. Though we do not suggest painting your gutters because it is a long, time consuming job that’s results do not last as long as replacing your gutters. ( Check out all the great colors available today) If you’d like a professional gutter cleaning before you start painting, call us for a free gutter cleaning estimate today! Why are my Gutters Pulling Away From Home? This is a very common question that we are often asked and issue we run into. 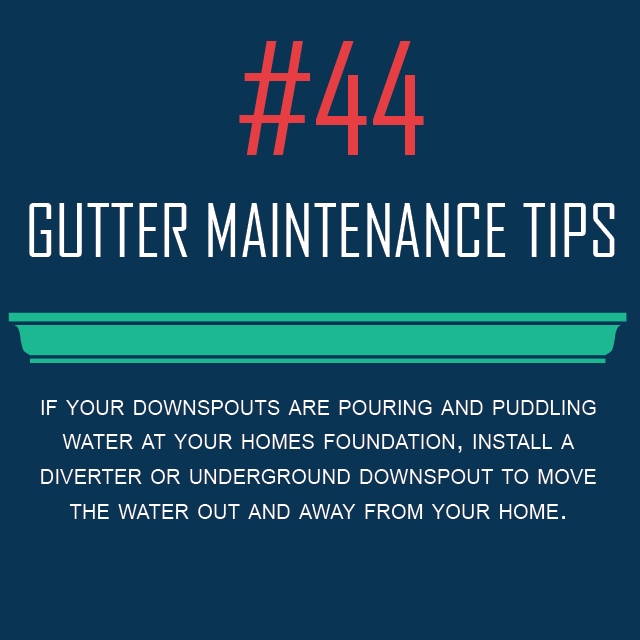 Gutters pulling away from home can be caused by a couple things. Fascia board can be rotten or the gutters could be weighted down ( by debris or water) making them sag. If gutters start to sag in the winter, it could be because of snow especially if there was a lot of accumulation. The gutter system should make sure that the water moves off and away from your home but they do require maintenance. 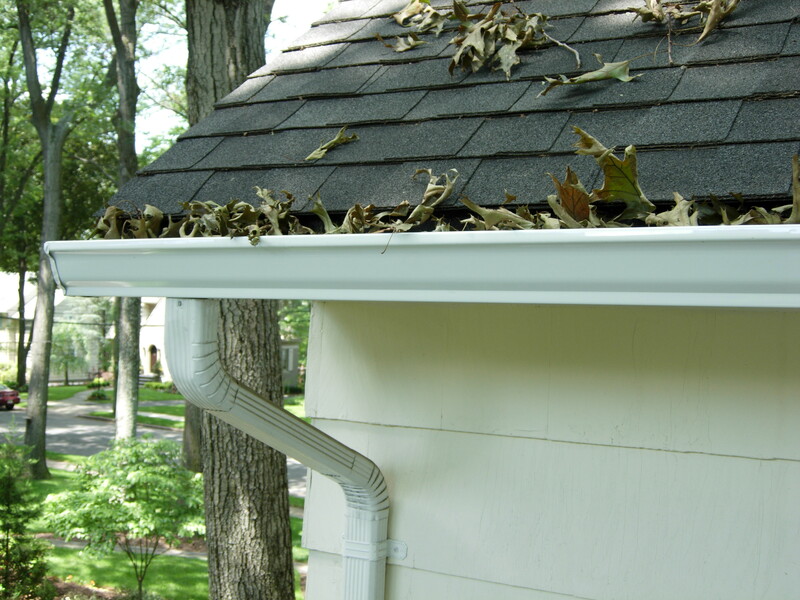 We suggest gutter cleanings at least twice a year, more if there are a lot of trees around your home. Gutters are secured to the fascia board with spikes or hangers. We, at Gutters & Guards, use hidden hangers. These hangers are not visible from the ground and in our opinion, they are much stronger than spikes. A couple ways you can prevent this is by installing gutter guards or by cleaning your gutters. If you notice that your gutter are not properly draining, check them and see if they are holding water. Clean gutters make it easier to tell if your gutters are holding water because of failing fascia board. Taking care of the gutter system on your home is one of the ways to preserve the life of your home. It also adds resale value to your home, as the curb appeal is increased. Gutters should never pull away from the home. Instead, they should remain flush with the edge of the roof and be clear of any debris and standing water. What kind of gutter debris are you dealing with? This questions sounds still but solutions for gutter debris can be used for different types of debris. When you’re cleaning your gutters, these solutions may help you clean a little faster. 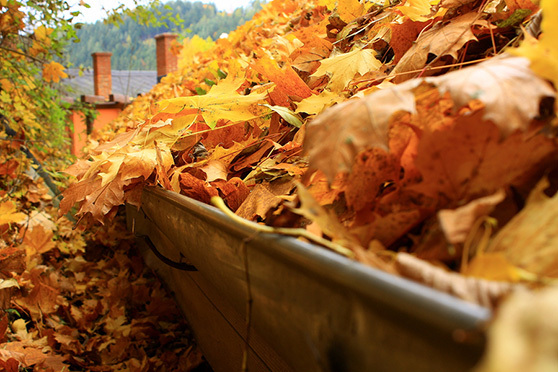 Fine Debris such as pine needles and small leaves, can slip in your gutter unnoticed and build up over time. Pine needles can accumulate and become heavy fast. 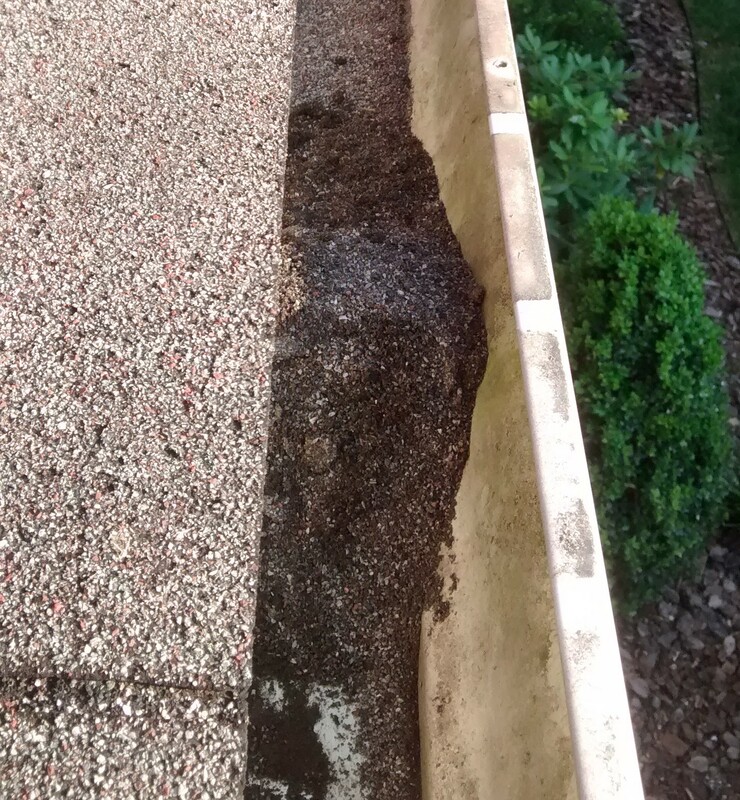 If they sit in your gutters for a long time it can cause your gutters to sag or for water to build up over time. Fine screen mesh gutter guards are the best solution to keep the needles at bay. Products like Mastershield and screen mesh are best for this. Your standard drop in gutter guard has openings that are too large and will not be able to keep out needles. Both Mastershield and screen mesh have fine smooth surfaces for debris to easily flow over the gutter and not clog your gutters. Dirt and shingle grit are another common debris that can be found in your gutters. Mastershield prevents shingle grit from getting in your gutters but screen mesh not so much. Hooded gutter systems could protect your gutters from the majority grit but not all. If an absurd amount of shingle grit is getting into your gutters, it may be time for a new roof. In the springtime, pollen and other blossoms can find their way into your gutters. They make the inside of your gutters slightly sticky because it’s almost a powder like substance and this can get debris to stick to your gutter. Running the water hose over your gutter and/or gutter cover can help dissolve the pollen. You should already be cleaning your gutters after the long winter season and doing any necessary repairs. Summertime brings the bees. That means being more careful when you are working outside and around the house. Bees and gutters are a common area where they can build a nest or on a roof eave. Common areas that you will find nests are behind the fascia, gable vents, peaks, eaves, awnings and other small areas. They can be pretty easy to spot depending on the location, if not consult a professional. If you happen to randomly come upon a nest, don’t panic. Quickly just walk away or slowly go down the ladder. Acting frantically or moving quickly can be dangerous, especially if you are high in the air. Removing the can be a bit more difficult. If you are allergic to bees, hire a professional. It’s not worth it. If not, you can dress in thick clothes, gloves, hat, googles, etc. to protect yourself. The best time to protect yourself is in the evening, they are most inactive. One application or pesticide or spray should do the trick. 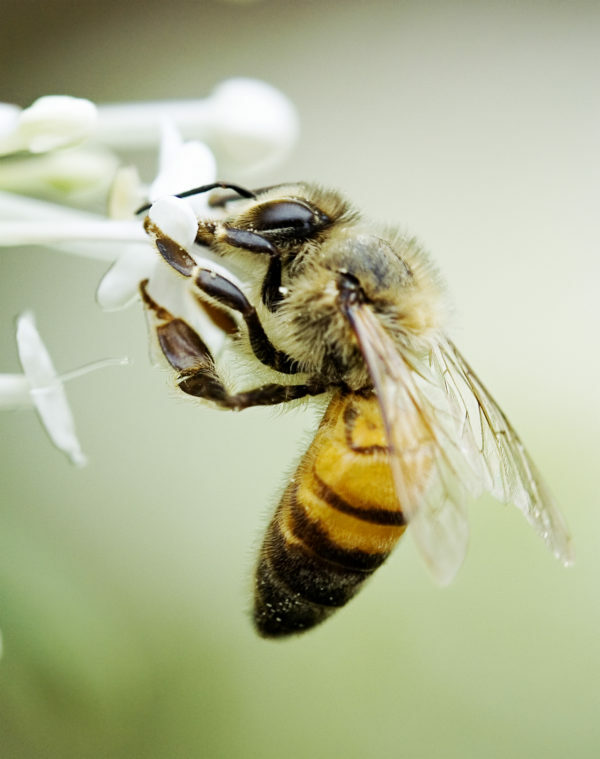 Monitor their activity and once the hive is inactive, remove it and if the hive was in an area where bees should not be, caulk or make that area inaccessible. In the event of a sting, the first thing to do is remain calm and balanced. Ask your pharmacist ahead of time for medication that will counteract the pain and swelling from a sting. And of course, if the situation feels serious, do not hesitate to call 911. Gutter guards are a great way to help keep debris out of your gutters, but a little gutter guard maintenance is needed. Depending on the type of gutter guards you have, debris can get stuck on them. Mesh guards can get sappy and debris and harden onto of the screen. If you really allow your gutter guards to take care of debris and do not check them at least once a year, you may find that seeds, or debris can make it into your gutter and even start to grow! We suggest that you check your gutter (even with guards/covers) at least once a year for any signs of failure. Problems such as gutters pulling away from your home, or damage to your covers, can cause larger issues in the future. 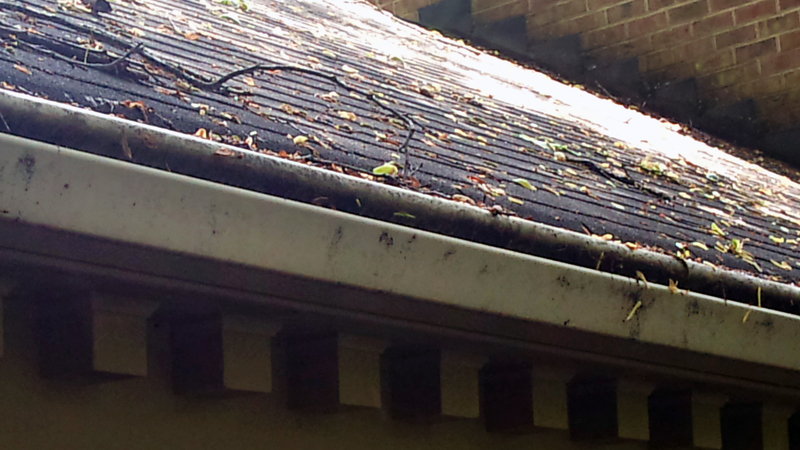 Large branches that land on your roof can cause debris back up and damage your gutters too. Tree sap and other natural gooey substances can make your gutter covers sticky. Mastershield Gutter Guards guarantee a no clog and that they can clean off any sticky substance (Learn more). Other gutter guards and covers do not have that guarantee and sap can accumulate on your gutter guards. In the summer, rain will move debris off the trees and on your roof. Lighter storms won’t move larger debris as fast such as leaves and twigs. Then with the fast drying from the heat and sun, it can bake leaves on your gutters. An easy clean for this is to take a soft bristle brush and water hose and rake the debris off. For a free estimate on gutter guard maintenance, repairs or adding gutter guards, call us today! Our experienced team will take the guess-work out of the process, and ensure that your home is protected. Patio Furniture Clean Up. This summer choose a sunny, warmer day to pull your patio furniture out of storage and deep clean it if you have not yet. Like we’ve said above, choose a sunny day. It give your furniture and cushions ( if washable) time to dry. Before you get started, gather all your materials such as: soap, glass cleaner, bucket, water, sponges and your garden hose. 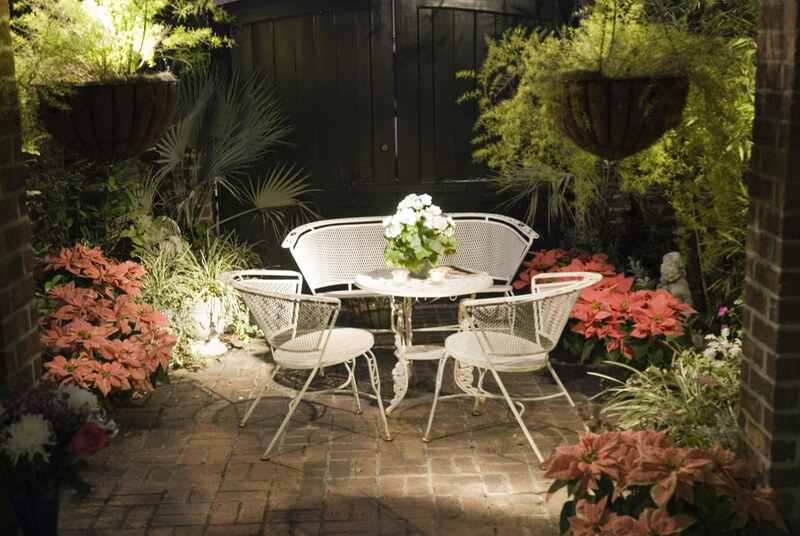 Choose cleaning method based on the type of patio furniture you have. Below we have 4 different methods for wicker, wrought iron, wood, and plastic, as well as cushions and the umbrella. Bring all the furniture and set it on a concrete slab. Mix 1/4 cup of mild dish soap with one gallon of water, then dip a brush or sponge and scrub furniture. After you give them a good scrub, rinse with water and let them air dry. If you notice water spots, wipe them with a cloth. The same cleaning method can be used for glass top furniture and after they dry, spray with glass cleaner and wipe clean with cloth. For wicker furniture, use a soft bristle brush and the soap mix from above. This will dislodge dirt and remove stains. Rinse with garden hose and let air dry. For wood furniture, the cleaning mix is a little different. Combine two oz of bleach with one gallon of hot water. Use a sponge and apply to furniture. Let it sit for 15 mintutes and use a soft brush to scrub. Scrub WITH the grain not against. Rinse with garden hose and let air dry. Wrought iron furniture can be a bit trickier to clean, especially if there’s rust. If there is rust, remove the rust with sandpaper and repaint as needed. If there is no rust then you can wash your furniture with a soap mixture used for the plastic chairs. After you rinse the soap off the furniture you can take an extra step and finish with a coat of wax. 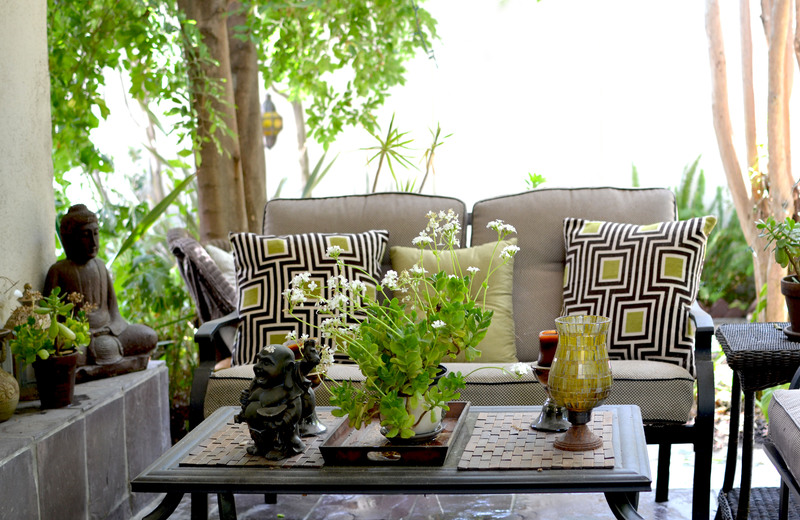 To clean cushions, lay them out on a hard, clean surface, but don’t put them on grass or dirt. Spray the cushions with a hose using the nozzle attachment, then pour dish soap onto a wet sponge and scour the cushions. Rinse your cushions clean with the hose until all the soap is gone. Kneel on each cushion, pressing it from top to bottom, to squeeze the water out, also flip the cushions every few hours so both sides can dry. If your cushions did not make it or are old, you can toss them out or just replace the fabric on them. To clean a patio umbrella, place old sheets on the ground, then spread the opened umbrella out on top of the sheets. Use soapy water and a scrub brush to remove dirt, then rinse it thoroughly with a hose. Let the umbrella air dry completely before putting it back up. Downspout Diverters help move water leaving downspouts. If water pools at the foundation of your home it can cause major foundation problems that are pricey to repair. 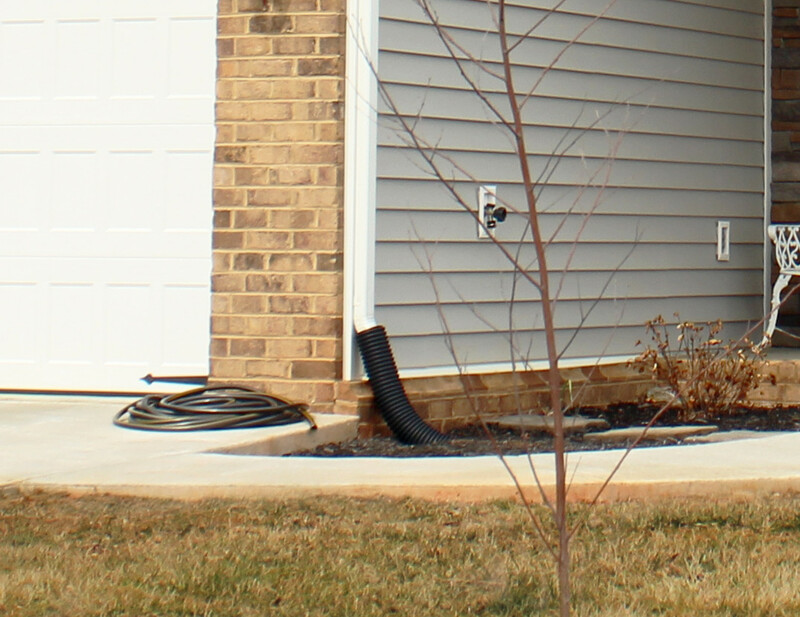 Downspout extenders can carry water away from your home. A Downspouts diverter fits to the bottom of the downspout and extenders can carry water several feet away from your home. Install underground downspouts. Can crushed by riding lawn mowers over time. The are harder to get unclogs and costly to dig in. To learn more about divertors and keeping water away from your home, contact a professional to see which option would be best for you to keep water away from your home. For a free estimate on gutter cleaning, repairs or adding gutter guards, call us today! Gutters & Guards experienced team will take the guess-work out of the process, and ensure that your home is protected.